Retired farmer Patrick Wall will lead the parade in Ennis next week. A RETIRED FARMER from Clare has been named the grand marshal of this year’s Ennis St Patrick’s Day parade. 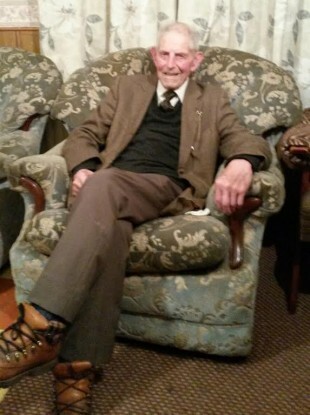 Clare County Council selected 97-year-old Patrick Wall following a search for the oldest Patrick in the county. Wall will join Mayor of Ennis Pat Daly next Thursday in leading the parade in a horse-drawn carriage, which will be followed by around 50 groups. Born on 25 February, 1919, he lives in Ballydineen, around three miles from the village of Kilmihil. His daughter, Carmel Bohannon, put his name forward for the position and said his selection was a great honour for the family. She said her father had joked “sure, that must nearly be” on hearing of the search for the longest-living Patrick in Clare. “Dad has always enjoyed good health and attributes that to plenty fresh air and hard work,” Carmel said. He is a very popular man in the locality and always made himself available to lend a helping hand to his neighbours and friends down through the years. Over 10,000 people are expected to line the streets of Ennis on 17 March for the annual parade. The event is one a number of festivals taking place across the country on St Patrick’s Day. Email “Clare found the county's oldest Patrick (97) for its St Patrick's Day parade”. Feedback on “Clare found the county's oldest Patrick (97) for its St Patrick's Day parade”.